Fans at the Family Weekend game in September. Redbird Championship HQ at GoRedbirds.com/Frisco. Die-hard Redbird fans are savoring their team’s first trip to the FCS national championship game Saturday, with many headed to Texas to witness history. But for more casual fans, or alumni who haven’t been on campus recently, this remarkable 13-1 team and its star players may be less familiar. That’s OK—there’s plenty of room on the bandwagon. Junior running back Marshaun Coprich: Affectionately known as the “Young Bull” by his coaches and teammates, Coprich became the first player in school history to rush for over 2,000 yards in a season. That included 13 straight games with 100-plus yards. Senior wide receiver Cameron Meredith: He moved into the No. 4 spot on the list of ISU receivers with 1,000+ yards in a single season. He also had this amazing one-handed grab vs. Eastern Washington (skip to 30-second mark) in the playoffs. Senior kicker Nick Aussieker: He hit back-to-back game-winning field goals earlier in the season, so don’t get too worried if the game is close in the fourth. 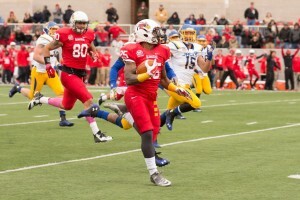 Marshaun Coprich rushes during Illinois State’s Homecoming football game on October 4, 2014. Just how historic has this season been? In addition to achieving Illinois State’s first 10-win regular season, the ’Birds also broke their single-season rushing record. 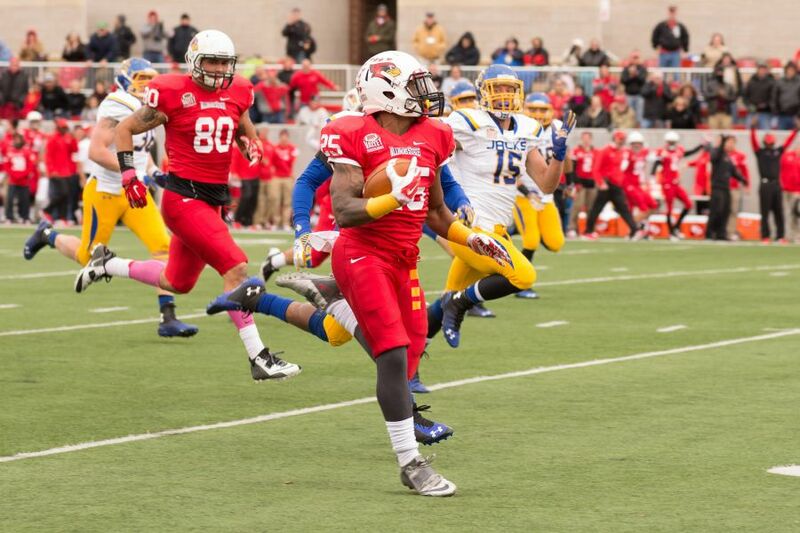 For Saturday’s title game, one passing touchdown will give the Redbirds the school record. They currently sit at 29. Two total TDs would tie the season school record of 66. This is also the first time in NCAA FCS history that two teams from the same league (Missouri Valley Football Conference) will face one another in the championship game. North Dakota State is good. Really good. The Bison are looking to become the second football team in NCAA history to win four straight national championships. Although the two Missouri Valley rivals did not play each other this season, they both went 7-1 in league play with their only losses both coming at Northern Iowa. Football Bowl Subdivision (FBS) schools play in bowl games and are allowed 85 scholarship players. Football Championship Subdivision (FCS) schools compete for an NCAA championship through a playoff format and are limited to 63 scholarship players. So which is better? Consider this: FCS powerhouse North Dakota State beat its fifth straight FBS opponent earlier this season (Iowa State).